The last thing you want in your cozy home is some rodents that want to share it with you. Nearby fields, or some recent construction may turn up some mice or rats that venture to your house for food, warmth or shelter. Read on to find out how to secure your home or business against unwanted rodents using various rodent exclusion methods for keeping them out. Rodent Noises in the Attic? If you are hearing noises in your attic or walls, chances are it is not just your imagination. Mice and rats are common visitors in home attics, especially in the colder fall and winter months when they venture indoors looking for food and shelter. Your attic insulation provides a warm, comfortable and secluded nesting location for rodents. Rodents are likely to be undisturbed in your attic and wall voids. Since rodents are nocturnal, you might start hearing sounds at night just when you are laying down to go to sleep when all is quiet. Since mice and rats produce offspring rapidly, chances are that the sounds you are hearing above are not just from one rodent. One mouse can produce up to 60 offspring a year. Once it is confirmed that you have rodents invading your structure, you will want to lure them outside. 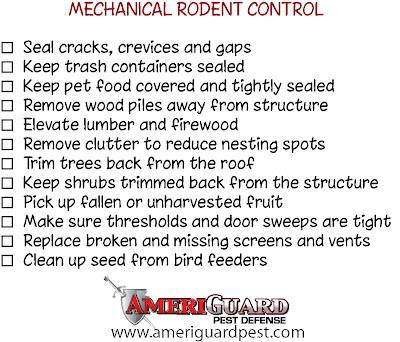 The rodents are most likely traveling between the inside and outside of your home where they return to their nesting location. Rodents will take the same pathway, which will be worn and marked by the body grease trapped in their fur. Rodent bait boxes should be placed strategically to draw the rodents out of the structure, if possible. 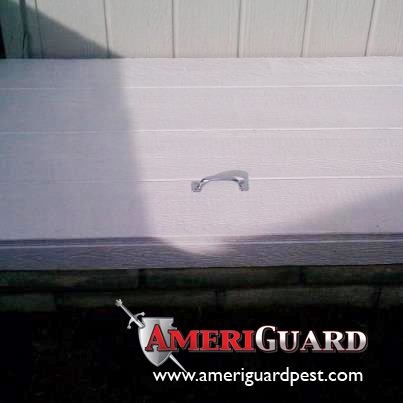 An effective rodent control program should be combined with a rodent exclusion or rodent-proofing service. A free rodent exclusion quote will be offered with each scheduled rodent service. Rodents are getting in to your attic through some means. 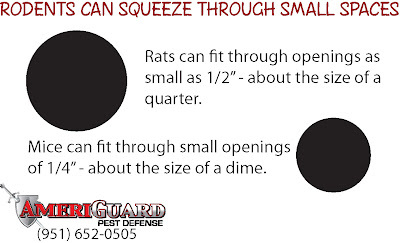 A small hole the size of a 1/2″ in diameter (approximately the size of a quarter) is all that is needed for a rat to gain access into the structure. Mice need even less of an opening – about 1/4″ in diameter or the size of a dime. Rodents can also invade sub areas below a house, especially in a crawl space under a home with a raised foundation. This sub access area was providing access for rodents to burrow under a home with a raised foundation. Sub areas beneath homes are perfect secluded harborages for rodents. Our wood repair and rodent experts constructed this new sub access cover. 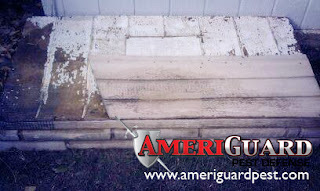 Rodent proofing your home is a necessary step topreventing a rodent infestation. Each rodent control baiting or trapping program comes with a free inspection at the initial service. The technician will inspect for entry points and provide a rodent exclusion quote for any work that needs to be done to secure the property against rodents. The technician can also provide a quote for a decontamination service to disinfect, sanitize and treat for viruses in areas where there is evidence of rodent droppings and urine and/or dead rodents. 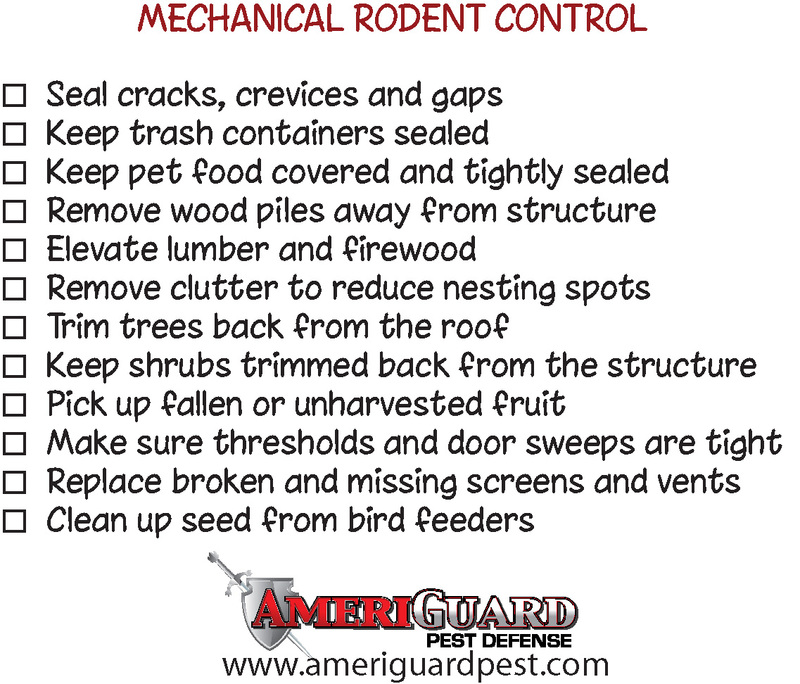 If you suspect rodents in your attic based on noise, droppings and/or damaged items, contact AmeriGuard Pest Defense to set up a rodent control service by calling (951) 652-0505. We often have same-day services available.